Can I cook more than one bag of Success® Rice in the microwave? It is not recommended to cook more than one boil-in-bag in the microwave. The range-top method is best for multiple bags. Can I cook Success® Rice in a crock pot? 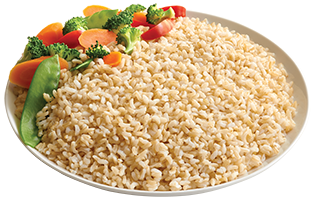 Success® Rice is precooked and dehydrated and only requires 10 minutes to re-hydrate. Since a crock pot recipe requires several hours of cooking time, it is recommended that you fold-in cooked Success® Rice towards the end of the cooking time. Can I cook Success® Rice in a microwave oven? In a 2-quart microwave-safe dish, submerge 1 bag of Success Rice in water (about 1 quart). Microwave on HIGH 10 minutes. Remove bag with fork or tongs and drain. Cut open and empty cooked rice into a serving dish. Add margarine and salt, if desired. Microwave ovens vary. Cooking times are approximate. We do not recommend using the microwave to cook multiple bags. Refer to the RANGE preparations. Can I cook Success® Rice in a pressure cooker? Can I cook Success® Rice in a rice cooker? Can I cook Success® Rice in a rice steamer? Can I cook Success® Rice in any liquid other than water? YES! Use bouillon, broth or non-creamy soups. 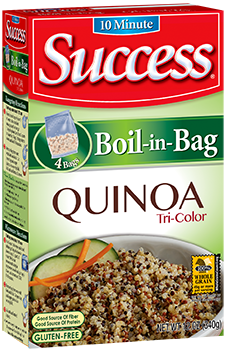 Put 1¼ cups soup or broth and the contents of one bag of Success® Rice in a pot. Bring to a boil. Simmer 10 minutes or until liquid is absorbed. Can I cook Success® Rice out of the bag? Yes .... Success® Whole Grain Brown Rice, White Rice, and Jasmine Rice can also be prepared "out of the bag". In a large saucepan, bring 6 to 8 cups of water to a boil. Cut open 1 or 2 bags of Success Whole Grain Brown or White Rice and pour into boiling water. Boil 8 to 10 minutes. Please note --- for Success Jasmine or Basmati Rice, boil for 10 minutes. Drain in a colander and serve. Can I use Success® Rice in a casserole recipe in the oven? Yes! Click below for some recipes. Given the recent press on cooking with plastics in the microwave, is it safe to cook Success® Rice in the microwave? Yes. The Success® boil-in-bag is made completely of food-safe plastic that is designed to safely tolerate the heat of cooking in a microwave. How do I cook Success® Rice at high altitude? Cook in more water and boil with lid on pot for 10 minutes. How do I reheat Success® Rice? Success® Rice can be reheated in the microwave. Just add a small amount of water and microwave until warm, approximately 1-2 minutes. How do I thaw Success® Rice that I have stored in the freezer? Rice may be kept in the freezer for an extremely long time. Place cooked rice in a freezer bag. When ready to serve, place rice in a microwave-safe bowl and add a little water. Microwave until warm, approximately 2-3 minutes. How long can Success® Rice wait in water? Success® Rice can wait in hot water with the heat off for as long as 30 minutes after it is cooked. If I cook more than one bag of Success® Rice, how long do I cook them? To cook multiple bags of Success® Rice, pour 3 quarts water into large saucepan and submerge 2-4 bags of Success® Rice. Bring water to a boil and boil uncovered for 8-10 minutes. Remove bags with fork or tongs and drain. We do not recommend using the microwave to cook multiple bags. What can I do with leftover Success® Rice? Store in refrigerator for one week or in freezer for up to six months.